Translation, interpreting and other forms of communication support within public sector settings constitute a field which deals, quite literally, with matters of life and death. Overshadowed for many years by interpreting and translating in other domains, public sector interpreting and translating has received growing attention in recent years, with increasingly mobile populations and human rights, diversity and equality legislation shining the spotlight on the need for quality provision across an increasing range and volume of activities. 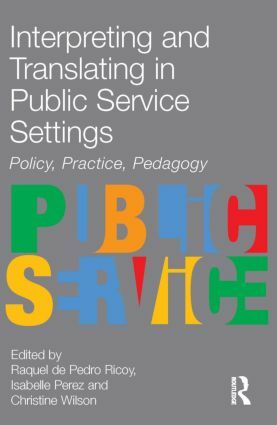 Interpreting and Translating in Public Service Settings offers a collection of analytically-grounded essays that provide new insights into the reality of the interaction in public sector settings and into the roles and positioning of the participants by challenging existing models and paradigms. Issues of local need, but with global resonance, are addressed, and current reality is set against plans for the future. The triad of participants (interpreter/translator, public sector professional and client) is investigated, as are aspects of pedagogy, policy and practice. Empirical data supports the study of topics related to written, spoken and signed activities in a variety of professional settings. Bringing together academics and practitioners from different countries in order to explore the multidisciplinary dimension of the subject, this collection should serve as a valuable reference tool, not only for academics and students of public sector interpreting and translating, but also for practising linguists, providers of language services and policy makers. Abstract. A Heriot-Watt University team from the Centre for Translation and Interpreting Studies in Scotland (CTISS) was commissioned by the Scottish Executive to review practice in relation to the provision of translating, interpreting and communication support (TICS) within the public services in Scotland in 2004. This paper introduces the research project, which was the first to gather actual evidence to support hitherto local impressions or anecdotal views and to take account of the full range of possible TICS needs and provision across all languages. The primary objective of the project was to study TICS provision from the perspective of two of the three participants in the communication triad: the TICS providers and the public sector bodies (PSBs). The paper outlines some of the findings of a comprehensive study of TICS providers in Scotland. It also presents a brief review of findings from the study of a sample of PSBs, at both grassroots and policy levels, in a variety of types of area across Scotland and in a range of sectors. It concludes with the presentation of a model based on the recommendations that emerged from the research project and which could provide a coherent plan for future developments in TICS. Abstract. Economic prosperity along with ensuing labour shortages and a marked increase in the number of asylum seekers and political refugees have had a significant impact on the ethnic and linguistic make-up of many of our societies. The past number of years has witnessed a renewed interest in issues of language policy and planning, emerging from these changes, where nation-states are becoming more varied, diverse and at the same time more global. Language policy and planning initiatives in the area of public sector interpreting in Ireland, Scotland and Spain are examined in this paper. All three contexts offer examples of cases where there has been a marked increase in the number of economic immigrants, refugees and asylum seekers in recent years. Language policy and planning measures which regulate for the provision of interpreting services to non-indigenous ethnic minority language groups in all three contexts are critically explored. This paper explores both overt and covert "top-down" policies at government and institutional level, as well as "bottom-up" and grassroots initiatives taking place to resist, protest about or negotiate declared language policies and to propose alternatives. Abstract. Whereas "role" and "role conflict" have been key terms in the research and development of public-service interpreting, this paper proposes, following Davies and Harré (1990), to substitute the notion of "positioning" for that of "role" in order to reflect the constantly evolving nature of interaction among participants in interpreter-mediated encounters. Positioning differs from footing in that, rather than being the choice of an individual speaker, it evolves as a result of joint negotiation among all the participants (i.e. positions adopted by one participant are either accepted and adopted by other participants or rejected and replaced). The main source of data is a series of televised immigration interviews that illustrate a variety of positioning behaviours. A number of (para)linguistic and pragmatic categories will be suggested to illustrate ways in which participants, by their discursive practices, position themselves and others and are, in turn, affected by each other's positionings. These discursive practices are seen as emanating from social institutions or "communities of practice" (Wenger 1998), which play a part in shaping the perceptions, stance, behaviour and utterances of all those involved. Teaching Interpreting in Cyberspace: The Answer to All Our Prayers? Abstract. An internet-based course on public sector interpreting was developed and tested by the authors for the University of Oslo and the Norwegian Directorate of Immigration in 2004. A mixed-gender group of 116 students (the majority of whom were immigrants) attended the online course, in which 13 working languages (including Norwegian as the common denominator) were represented. Drawing on this experience, the authors critically discuss both the advantages and the challenges of taking the interpreting student into the cyber-classroom, and illustrate that interpreting competencies and subject-specific knowledge can be successfully acquired in cyberspace. The pedagogical approach is inspired by experiential learning theory (Kolb 1984, cf. Boyatzis et al. 1995). Taking the importance of interpreter training as a starting point and using examples from the cyber-learning environment created for the course, the authors demonstrate the applicability of this pedagogical approach to the instruction of interpreters in general and its relevance in the context of an online-based approach in particular. Abstract. This paper explores interpreting practice in the field of emergency medicine. The analysis is conducted on a corpus of taperecorded interpreter-mediated encounters between the medical staff of an Italian hospital and English-speaking tourists. The specificity of the setting - an Accident & Emergency Ward - where patients are not members of a minority community, but feel nonetheless vulnerable because the emergency has occurred away from home, as well as the unusual profile of the interpreters who are employed on a seasonal basis as "administrative assistants", make this study an atypical investigation into public service interpreting. Through the use of different theoretical approaches - from Fairclough's distinction between powerful and non-powerful participants, to ten Have's notion of phase-specific conversational patterns, to Hall's theory of contexting - it is demonstrated that asymmetry in medical encounters is the product of a complex set of factors. More specifically, it is a shifting variable which is locally and interactionally determined through successive turns at talk by all interlocutors, doctor, patient and interpreter alike. The latter, in particular, is seen to behave as a fully-fledged social actor who makes independent choices on the basis of his or her assessment of the goals and requirements of the ongoing activity. Abstract. In this paper, two frequently used models of interpreter and user cooperation are described: the translation machine model and the interactive model of interpreting. The paper provides a summary of observations made on the basis of some empirical data (extracted from videotaped interpreter-mediated psychotherapeutic sessions) with regard to the adherence of participants in the communication to these models. It concludes that the translation machine model is,in essence, an ideology, but that translation machine techniques are used in practice. It also concludes that the translation machine ideology denies the interactional realities of interpreter-mediated talk, which leads to the unwarranted assumption that interpreters actually make equivalent renditions that do not need any repair strategies.The interactional approach, however, leads to the questioning of the concept of equivalence and to the use of repair strategies in the practice of interpreter-mediated talk. This ultimately leads to the mutual understanding at which this type of talk aims. Abstract. "Language [consists] of socially and politically situated practices that are differentially distributed on the basis of gender, class, race, ethnicity and other phenomena" (Briggs 1996:4). Discursive features can index, at times simultaneously, a number of social and political positions and identities. One such position/identity is gender. As a salient social category, gender is discursively foregrounded through a variety of utterances and silences and, in certain languages, through mandatory grammatical markers. This paper presents the results of a study aimed at assessing the reactions of Francophone nurses in Ontario (a Canadian English-speaking province) to translated documents produced by their regulatory college. More specifically, the purpose of the study was to determine the impact of the feminization of texts directed to a predominantly female readership. This qualitative analysis focused on respondents' attitudes toward the feminization strategies used by translators, but also produced surprising data regarding reactions to gender neutral texts in either English or French. The study demonstrates that certain discursive/translation strategies aimed at redressing inequalities may be perceived by some readers as detrimental. In fact, results show that gender cannot be separated from other salient social, political and economic factors. Abstract. Several authors (e.g. Berk-Seligson 1990; Jansen 1995) have described how court interpreters tend to adopt a more active role than would be expected, and how this can influence the end result of their work. They may perform functions that, in principle, fall within the remit of professionals from other fields: provision oflegal advice and, in extreme cases, social work. The aim of this paper is to analyze this active role from the standpoint of the interpreters themselves. It is based on research involving 19 subjects who replied to a questionnaire exploring the perceptions of practising court interpreters in the Madrid region of Spain with regard to their work. The topics covered include controversial issues at the centre of the debate about the court interpreter's role, such as adaptation of language register, cultural explanations, expansion and omission of information and the relationship between interpreter and clients. It was crucial to determine whether court interpreters, at least in Spain, are aware of what their role is, where its limits lie and what reasons may induce them to go beyond their established functions. The results indicate that the majority of practising court interpreters seem to go beyond the remit that codes of ethics stipulate. Abstract. The pragmatic significance of modal particles in interpreted discourse has not received much attention in dialogue-interpreting research. Particularly in instances of interpretation between languages that differ in the frequency of use of modal particles, the way in which interpreters deal with the pragmatic intention of such discourse markers merits investigation. This study is based on the analysis of five passages from an authentic asylum interview held by the German immigration authorities and interpreted between German and English. The use of modal particles is a prominent feature of the immigration official's questioning technique, whichseems designed to reduce distance and improve rapport, while urging the applicant to provide more detailed information about himself. The interpreter is found to introduce pragmatic changes by rendering questions less forceful or reducing the openness of questions. Modal particles used to convey casualness are omitted by the interpreter, as are particles that subtly indicate the immigration official's growing scepticism. The overall effect of the interpreter's deletion of pragmatic content from the official's questions on the discoursal atmosphere may have crucial consequences for the goalof the encounter: to establish the applicant's story of persecution and, above all, the truth of his assertions. Abstract. This paper examines the role of the sign language interpreter in workplace settings and outlines the case for the interpreter as an integral, visible and active part of the communication process. The authors argue that, in order to work effectively and successfully in any setting, sign language interpreters must continue to move away from the pervasive "interpreter as conduit" norm and must consider working in a more transparent and open way, involving and informing all parties in the communicative interaction. The workplace is a complex environment, with its own specific rules and culturalnorms. People present different social identities at work and these identities are continually negotiated and constructed through interaction with their colleagues. Sign language interpreters have to be aware of all these complexities and must act as cultural mediators, working in a participatory way with both Deaf and hearing clients in order to co-construct a shared understanding of discourse andaccurately reflect and replay the shifting, hybrid identities within that discourse. Drawing upon data from a study into the experiences of sign language interpreters in the workplace environment, the article explores the ways in which all primary participants can contribute to a more successful interpreted outcome.